Dream, Create, Inspire: Shabby Chic Returns! This lovely book is now available. . . earlier than expected! I found mine at Barnes & Noble. And it's everything (and more!) that I thought it would be. 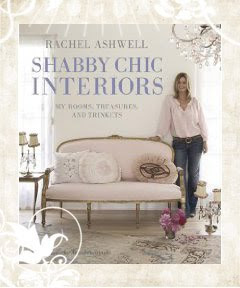 And in related news, Rachel's store in Santa Monica has reopened under the name, Shabby Chic Couture. Isn't that exciting! Oh how I wish the one here in Chicago would reopen too. There's more info and photos on Rachel's Blog here. i KNOW!!! i had it on my wish list at amazon and i thought it was still on preorder...i ordered mine last night...i can't wait to see it!! !